We knew things are going well for Japanese brokers in 2013 as the nation’s, and world’s top two retail FX brokers by volume, GMO Click and DMM Securities posted record results.In addition to FX, the Japanese equity market has also been rallying with the Nikkei 225 rising around 25% in the past three months, leading to a resurgence in volumes. Enjoying the success in both FX and stocks, Monex Group has also reported healthy volume growth for 2012. As can be seen below, the broker reported ¥176.1 billion ($1.85 billion) in average daily FX volume (ADV). The figure was a small gain above January’s figures and well above volumes from 2012. 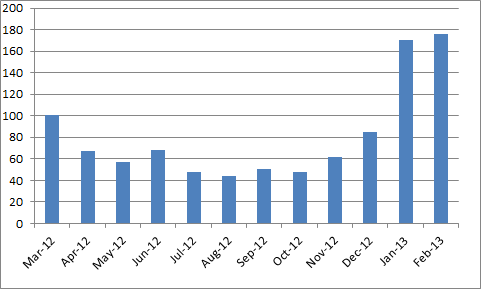 The numbers were achieved, even though the number of active clients, 53,069, was right around levels of 2012. In addition to FX, Monex saw Stock Brokering activity rise during 2013. During February, clients traded an average of 145,831 trades a day, 65% higher than the same period in 2012. While FX still outperforms equity trading in Japan, the return of optimism towards the local market is important to watch. In our latest Quarterly Report, we took a look at the Japanese market and how it had rebounded after restrictive regulations were passed in 2011 (see excerpt). One of the reasons that was cited as leading interest to return to FX was that due to poor performance of equities, traders were more likely to be attracted to currency trading. As such, due to the global appeal of stock, a bull market in equities was seen as a potential negative to the FX market as it could draw interest away from the asset. While we definitely aren’t seeing that happen yet, it’s worth keeping eyes on for 2013.